Buy a stately, self-expressive structure. From the heart of Lancaster County. Ready to give your venue a total face-lift? 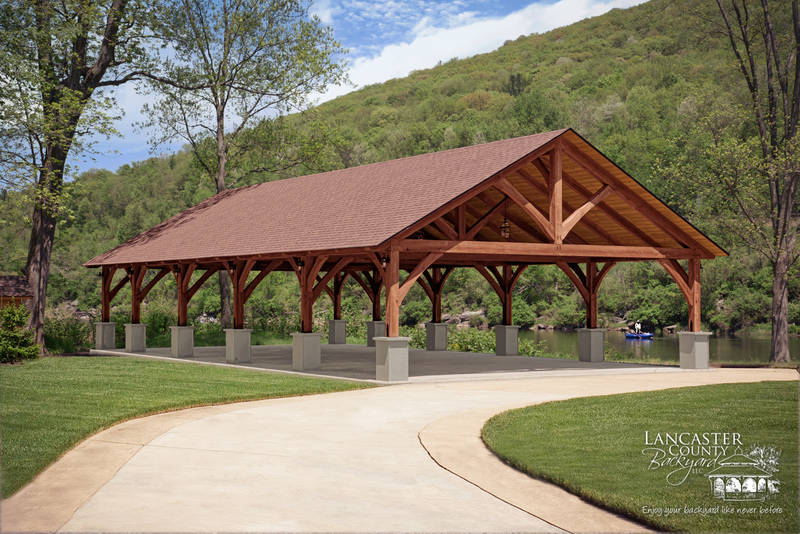 Whether you’re looking to enhance your backyard experience, or totally transform the terrace at your retreat, church, daycare center, local park, or business, the a Timber Frame Pavilion from Lancaster County Backyard will impress and entertain your guests for years to come. Standing head and shoulders above your average outdoor pavilion, the Kingston Timber Frame Pavilion is a riveting expression of mankind’s love for the beauty of natural wood. The iconic kingpost timber frame truss design exudes strength and character. The pavilion is designed to complement a scenic outdoor area—perfect for large gatherings and weddings. Curved knee braces housed in 8×8 timbers. Massive truces provide main structure for roof system. Strong rafters support the tongue-and-groove roof decking. The Denali Timber Frame Pavilion from Lancaster County Backyard contains more than meets the eye. When combined with the magnificence of the exposed post and beams, the distinctive hammberbeam split-truss design endues this little structure with a truly enormous spirit. Whether in your backyard or business, the hammerbeam will provide you with a lasting, spacious, and satisfying experience. Curved knee braces housed within the split-truss roof timbers provide a cathedral-like open feel in this backyard sanctuary. What’s so special about a timber frame pavilion? Popular construction methods tend to separate the strength and style of a building. It’s very common to build a structure and then cover it up with facade materials in order to make it “look good.” In a timber frame pavilion, on the other hand, there isn’t a single piece covered or hidden in order to promote a certain look. The natural elegance and strength exuded by the heavy exposed posts and beams in a timber frame pavilion serve to illustrate the best of man’s creative use of nature. Rather than following the trends and fads in popular cheap building assembly, timber frame construction harkens to a time when men built to bring glory to God through mirroring the excellence and beauty of creation in their work. If you want to find out more about this truly timeless style of construction, contact us to find out more of our timber frame options. Are you drawn to timber frame designs that are unique and multifaceted? The Grand Teton Timber Frame Pavilion incorporates a graceful arched rib, held with powder coated strapping, giving the truss system a stately and stylish feel. This greathearted design is ready to accommodate family, friends, guests, and/or events in any setting. Ready to get started? Get a quote today! Original & eye-catching architectural design. Bold powder-coated brakets add clarity and appeal. There is no reason to restrict the charm and dignity of a timber frame pavilion to a standalone structure. Attach a timber frame pavilion to your house or business and totally revolutionize the face of your buildings! We’re eager to help you explore the possibilities of revamping your estate, storefront, or mountain retreat with an extended porch or attached pavilion. Attach either a Kingpost, Hammerbeam, or Arched Hammerbeam Timber Frame Pavilion to an existing structure. Extends your home or business to include outdoor living space. I recently had a pavilion built as part of a back yard project. From beginning to end, my experience with the Lancaster County Backyard staff and their craftsman was exemplary. They were all very knowledgeable, professional, courteous and wonderful to deal with. I was also building an attached stone fireplace to the pavilion by another contractor. Kevin (of LCB) was very knowledgeable at a such a detailed level, I knew he was very experienced. When we reviewed the project, I truly felt like he was helping build a family member’s Pavilion. I would recommend LCB without any reservations and they can use me as a reference anytime. Thank you Kevin and LCB. These guys FAR EXCEEDED my expectations. From Elmer coming out and helping with the design/ quote to the team that raised my roof in a day, I couldn’t be more pleased. It’s rare you come across a contractor now a days that is courteous throughout the process, shows up when they say they will, and gives you more than you could have hoped for! Well done Lancaster County Backyard! From start to finish we received excellent service. We were shown a picture of what we purchased and it was a 100% match. The Pavilion is beautiful. The men Installed it in one day and that in it self was impressive. I highly recommend them to complete your project. I just had a pavilion installed from Kevin and his crew. They arrived early on Tuesday morning and working tirelessly throughout the day. I had many questions as the work progressed, Kevin patiently answered. Kevin is respectful, hands on, and oversees all of the installation. My husband and I were extremely satisfied with the entire process. We would highly recommend Kevin and his crew to anyone. After a summer of shopping for a pavilion with many disappointments we thought we would not get our pavilion that is until I had a phone conversation with Kevin. After this conversation with him suddenly I realized that he was not only interested in selling his product, but he wanted to be sure his customer would be happy. In my opinion he would rather not get the sale if his customer would not be happy. He shared information no other companies provided. After careful consideration of all the data we decided go with Lancaster County Backyard (Pequea Shed). Kevin and the crew arrived early Wednesday morning and worked all day to complete the project by around 4:30PM. The end result was absolutely perfect. Total perfection at it’s best!. Kevin and the crew was a real pleasure to work with. You can really tell when someone loves what they do. What I love best is that they love the Lord. I got that feeling with the very first phone call. It’s a pleasure to know you. God Bless !!! !